In severe untreated rheumatoid arthritis (RA), reductions in high-density lipoprotein-cholesterol, low-density lipoprotein-cholesterol and total cholesterol have been noted; this is in line with findings in other pathologies/conditions associated with inflammation or infection, such as sepsis, cancer, trauma or the postoperative period. Although the precise mechanisms remain to be established, cytokine-induced activation of the reticuloendothelial system is potentially critical to such changes. Consequently, dampening of inflammation in severe RA—as occurs with several biologics—may lead to increases, not only in high-density lipoprotein-cholesterol, but also with other lipid moieties, including total and low-density lipoprotein-cholesterol and, perhaps, triglycerides. This concept is consistent with findings following antitumour necrosis factor treatment and interleukin-6 receptor inhibition in patients with RA. At the same time, it is increasingly apparent that potent dampening of inflammation, however achieved, broadly reduces the risk of cardiovascular disease in RA. Therefore, changes in lipid profiles, particularly increases in cholesterol and triglycerides that occur with treatments for severe inflammation, may not represent increased cardiovascular risk as in the usual understanding of lipid-level elevations in individuals without significant inflammation. Rather, changes in lipid levels, in part or largely, may represent a predictable response to attenuation of inflammation. These observations are increasingly important clinically and should aid in the understanding and interpretation of lipid changes under inflammatory conditions, as well as in the context of potent anti-inflammatory interventions. 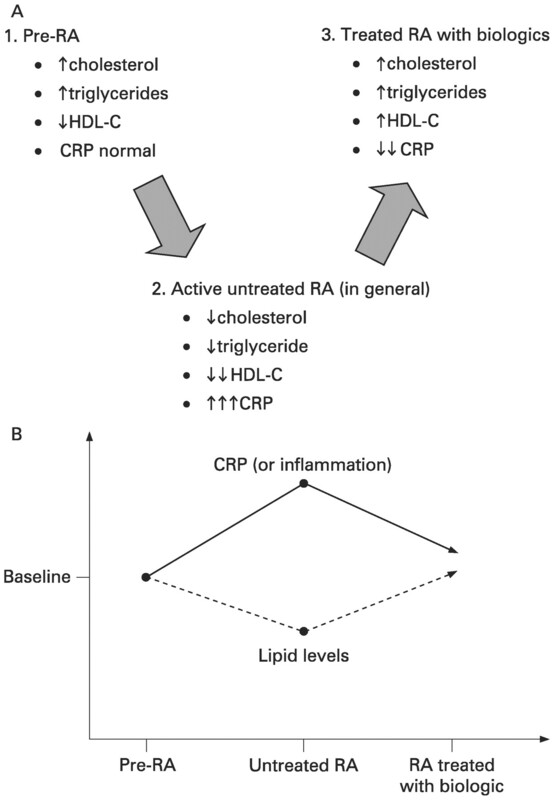 This review presents a detailed discussion of the relationship between CVD risk, inflammation and lipids levels in patients with RA. It summarises recent evidence of increased lipid levels in patients treated with biologic therapies and outlines possible underlying mechanisms. In addition, this review demonstrates that the pattern of lipid changes in the context of high-grade inflammation poses a challenge to conventional thinking. Of course, not all studies are consistent. Potential reasons for such inconsistencies include: (1) confounding effects of differences between patients with RA and controls in age, obesity levels, smoking and gender; (2) lack of power due to low numbers; (3) too narrow ranges of disease severity; (4) confounding effects of treatments such as steroids; and (5) differing stages of RA. Interestingly, cholesterol and triglyceride levels appear elevated before RA develops, albeit modestly,19 which suggests that the progressively lower cholesterol levels observed in active RA are related to the disease process. Therefore, current evidence, on balance, supports lower total and LDL-cholesterol levels in active, established RA. Decreases in HDL-cholesterol during infection or inflammation are common to many species, and the most consistent lipid abnormality in RA. Although the exact mechanisms remain unclear, reverse cholesterol transport is inhibited at a number of steps, leading to a lower cholesterol efflux from cells to HDL particles.27 In addition, displacement of apo A-I in HDL particles by other acute phase proteins (eg, serum amyloid A or haptoglobin) leads to a loss of the normal anti-inflammatory and anti-oxidative activities of HDL, and a reduction in circulating apo A-I levels in inflammation/infection.27 Interestingly, synovial fluid apo A-I may be increased in patients with untreated RA,28 suggesting that joints in patients with untreated RA become infiltrated by HDL particles. Rises in markers of inflammation or infection are commonly associated with a reduction in total and LDL-cholesterol in primates and humans, accompanied often by reduced serum apo B.27 The reticuloendothelial system may be a significant player. Its suppression leads to increases in LDL-cholesterol by dampening LDL receptor independent clearance.29 Thus, its activation (as occurs in inflammation or infection) would lower LDL-cholesterol, a finding confirmed by recent studies in activated macrophages.30 Other mechanisms, such as reduced LDL particle synthesis, may also be involved. The reticuloendothelial system may also be involved in lowering triglyceride levels in chronic inflammatory conditions. Clearly, more mechanistic studies are needed. The suboptimal response to DMARDs (either alone or in combination) and their toxicity with long-term use has led to the development of biological agents that target particular signalling pathways in patients with RA. These drugs are called biologics. Biologics initially targeted the proinflammatory cytokine tumour necrosis factor (TNF)-α and, more recently, the IL-6 receptor. These agents are, of course, generally used in patients with moderate-to-severe disease. As mentioned above, severe inflammation lowers lipid levels and this effect is more likely to be observed in patients with RA prior to biologic treatment because such patients, by indication, generally have more severe RA. Significant dampening of inflammation by these agents would, therefore, be predicted to increase HDL-cholesterol and total cholesterol levels. Available anti-TNF agents include the monoclonal anti-TNF antibodies infliximab and adalimumab, and the TNF receptor fusion protein, etanercept. Data concerning lipid changes with anti-TNF agents (table 1) show significant treatment-induced increases in HDL-cholesterol and total cholesterol or LDL-cholesterol in at least half of the studies, while increases in triglycerides have also been reported. We conducted a systematic review of the effect of TNF inhibitors on lipids in RA and included seronegative inflammatory arthropathies. Searches on Medline and PubMed using the keywords “tumor necrosis factor” or “infliximab”, “etanercept” or “adalimumab” and “cholesterol” or “lipoprotein” or “lipid” up to March 2008 produced 17 articles (table 1). Fourteen of these were studies in RA, one in psoriatic arthritis, one in ankylosing spondylitis and one included all three diseases. As studies were heterogeneous with respect to design, length of follow-up and type of intervention, a meta-analysis was not possible. With longer-term anti-TNF treatment (⩾6 months), the cholesterol:HDL-cholesterol ratio is generally unchanged despite variations in lipid parameters; in part this is because HDL-cholesterol also increases.31 37 38 Notably, shortcomings include low numbers of participating patients and lack of information regarding improvement/exacerbation of RA. Furthermore, in patients who achieved a successful outcome with either infliximab or methotrexate treatment, total cholesterol levels were elevated by approximately 28% and reported to be “normalised”, while infliximab induced twofold elevations in triglycerides.26 Peters and colleagues35 reported that following an initial decrease (thus improvement) in the cholesterol:HDL-cholesterol ratio, this benefit was lost after 22 weeks. In contrast, Popa and colleagues32 reported an increase in the total cholesterol:HDL-cholesterol ratio with increases in total cholesterol following 12 months of anti-TNF treatment in combination with standard treatment. In addition, treatment with infliximab in combination with standard treatment resulted in an initial increase in HDL-cholesterol, followed by a decrease, with a significant increase in the total cholesterol:HDL-cholesterol ratio at 24 months.39 In a population of patients with various inflammatory diseases, however, an increase in HDL-cholesterol after infliximab treatment was observed.40 The most recent published study of 97 patients with RA treated with infliximab for 1 year reported increases in both total cholesterol and HDL cholesterol levels.41 In a study of patients with ankylosing spondylitis (45 patients were treated with leflunomide or placebo and 10 patients were treated with etanercept), disease activity levels were significantly and inversely correlated with total cholesterol and HDL cholesterol levels, independent of treatment.42 Finally, a recent, small study demonstrated that, compared with infliximab, etanercept treatment may have a lesser effect on lipid levels.43 However, this last finding requires confirmation. Overall, the results suggest that anti-TNF treatment generally leads to an increase in circulating levels of all lipid fractions; with increases in total cholesterol of up to 28%, in HDL-cholesterol of up to 79% and in triglycerides of up to 125%. However, most studies have been small and only included post-hoc analyses of lipid levels. There is a need for larger, prospective studies to better document both the real scale of change in lipids following anti-TNF treatment, the time course of such changes and, importantly, the impact of these changes on CVD risk. Nevertheless, in several of the studies above, significant associations between lipid elevations and reductions of magnitude in inflammation add support for a causal link between these two processes. The results of anti-TNF-induced lipid elevations reviewed here should, of course, be considered in the context of mounting evidence that CVD risk is reduced, specifically, with anti-TNF treatment44 and, generally, with most RA treatments. Moreover, using data from the British Society for Rheumatology Biologics Register, Dixon and colleagues44 noted that the risk of myocardial infarction was significantly reduced in patients who had responded to anti-TNF treatment. If we consider this finding together with the observations of Saiki and colleagues discussed above26—that is, lipid levels are significantly increased only in patients who were classified as responders to anti-TNF treatment—the combined results go against the suggestion that biologic-induced elevations in lipid levels lead to enhanced CVD risk in the context of anti-TNF treatments. Rather, the potent reduction in disease activity with such treatments may explain both the pattern of lipid changes in RA (including increases in HDL-cholesterol and LDL-cholesterol) and the reduction in CVD risk. Indeed, many other risk factors, aside from the significant reduction in levels of acute-phase proteins and cytokines, clearly improve upon inflammation suppression (eg, thrombotic factors, lower oxidative stress, better vascular function, less insulin resistance).7 Finally, despite increases in total cholesterol levels, most studies appear to demonstrate that the total cholesterol:HDL-cholesterol ratio is not appreciably altered with anti-TNF treatment; even when this ratio is altered, the change is very modest (⩽25%). Lastly, it should be considered that increased LDL-cholesterol following treatment with a biological agent may not necessarily be more damaging, as its atherogenicity is dependent upon coexistent risk factors that also change upon treatment. These include a significantly suppressed systemic inflammatory status, improved vascular and metabolic function, and higher HDL-cholesterol levels. Inhibition of the IL-6 receptor leads to the improvement of signs and symptoms of RA, as well as systemic manifestations, and may improve several CVD risk factors. Tocilizumab is a humanised, monoclonal antibody that binds with high affinity to both the soluble and membrane-expressed forms of the IL-6 receptor,45 blocking IL-6 from binding to both membrane-expressed and circulating, soluble receptors. We performed a literature search with “tocilizumab” and “cholesterol” or “lipoprotein” or “lipid”, up to and including 2008, and collated all relevant data (see table 2 for details). In the first study by Nishimoto and colleagues,45 increases in total cholesterol, triglycerides and HDL-cholesterol were observed in the tocilizumab groups.45 In the Chugai Humanised Anti-Human Recombinant IL-6 Monoclonal Antibody (CHARISMA) study, moderate increases in total cholesterol, HDL-cholesterol and triglycerides were observed in the tocilizumab groups; however, these initial increases stabilised during the study.46 Notably, in the 8 mg/kg tocilizumab group, mean cholesterol:HDL-cholesterol ratios were reduced below baseline levels by the 20-week time point. In the SAMURAI study, no change in the mean cholesterol:HDL-cholesterol ratio was observed during the study, although increases in total cholesterol, triglycerides and LDL-cholesterol were observed in 38%, 17% and 26% of patients, respectively.47 Cholesterol levels after treatment were reduced in 27 patients who received treatment with statins (26 patients) or fenofibrate (one patient) for abnormal lipid levels. In this study, HDL-cholesterol levels were elevated above the normal range with tocilizumab treatment in 24% of patients. In these studies, tocilizumab treatment was consistently associated with increasing lipid levels in the context of decreasing levels of inflammatory markers. However, correlations between specific parameters were not reported. Importantly, no increase in cardiovascular events associated with tocilizumab was reported in any of these studies, although trials of longer duration are needed for confirmation. Thus, critically, just as anti-TNF treatments generally increase lipid levels in patients with RA, so does IL-6-receptor inhibition. These alterations are consistent with the predicted direction of change based on the totality of evidence, described earlier, for the effects of chronic inflammation on lipid levels and the reversal of such effects upon inflammation suppression (fig 1). Changes in lipid and inflammatory parameters associated with RA and its treatment with biologics. (A) Lipid levels may be higher before the onset of RA (1); however, levels of all lipid particles generally decrease in severe, untreated RA when inflammatory levels are high (2); suppression of inflammation with biologics can, therefore, be anticipated to raise levels of all lipids and current evidence support this paradigm (3). (B) Graphically, this figure presents the above paradigm in a simpler temporal fashion where the extent of reduction in inflammation parameters broadly correlate with elevations in lipid levels in RA. Again, current limited evidence supports this, but more studies are needed to determine if different biologics raise lipid levels to differing extents for the same degree of inflammation suppression. CRP, C-reactive protein; HDL-C, high-density lipoprotein-cholesterol; RA, rheumatoid arthritis. A review of the published literature demonstrates that treatment with biologics increases lipid levels (including LDL-cholesterol, HDL-cholesterol and triglycerides in patients with RA), but that such changes are broadly predictable and coincide with reduced inflammation. Further, there is increasing evidence for CVD risk reduction with anti-TNF treatment. In contrast, data from prospective, cohort studies indicate that dyslipidaemia or hyperlipidaemia is predictive of higher cardiovascular event rates in patients with RA (although disease state is not consistently defined).51 These two observations are not necessarily inconsistent; this is because, in the general population, those destined to develop RA have a range of lipid levels and CVD risk. Correspondingly, those who have higher cholesterol levels at or before disease onset will generally also have higher cholesterol levels at any given level of disease severity; however, in general, cholesterol levels will be lower when disease is active and patients are untreated, and that is when CVD risk is consistently higher. In other words, data from cohort studies integrate baseline lipid levels with effects of disease severity and treatment factors. It is a complex picture that requires further study. Several important questions arise from our current review. Are the effects of IL-6 receptor inhibition on lipids more pronounced than those of TNF antagonists? Direct head-to-head studies are needed, and these should address whether increases in lipid levels correlate with reductions in inflammation markers following treatment. Thus, whether potentially greater increases in LDL-cholesterol or HDL-cholesterol levels with IL-6 receptor inhibition are due simply to greater effects on inflammation suppression, needs to be examined. The mechanisms underlying the lipid reductions with severe inflammation in RA and increases in lipid levels with treatment require further study. Kinetic studies of lipid metabolism, together with more detailed analyses of changes in lipoprotein composition and related enzymes would help. It will also be important to clarify whether lipid reductions in RA are harmful or beneficial. On the one hand, an inflammation-induced reduction in HDL-cholesterol and apo A-I would encourage greater inflammatory activity by stimulating macrophage-T cell cross-talk.53 On the other hand, lowering cholesterol and triglyceride levels may lessen inflammation as higher levels of both have been associated with greater proinflammatory potential. Alternatively, increased macrophage uptake of lipids during inflammation may lead to a greater vascular risk via accelerated foam cell formation. At present, it is not easy to predict the net effect of a reduction in circulating lipids in active RA, nor, as we have demonstrated, is it easy to predict the net vascular effect of lipid elevations with biological treatment in patients with RA. Non-invasive imaging studies of atherosclerosis using biological agents may complement vascular event acquisition from registries and could provide added confidence that biological agents broadly lessen vascular risk. High-grade, chronic inflammation in RA can directly and indirectly accelerate vascular disease. In severe RA, HDL-cholesterol and total cholesterol levels are often reduced; these changes are frequently in line with inflammatory marker elevations. Reductions in HDL-cholesterol, LDL-cholesterol and total cholesterol in active or untreated RA are similar to findings in other pathologies/conditions that are associated with inflammation or infection (eg, sepsis, cancer or the postoperative period). In humans and primates, several cytokines are known to reduce both HDL-cholesterol and LDL-cholesterol levels; activation of the reticuloendothelial system is likely associated with such changes, but other mechanisms may be involved. Consequently, dampening of inflammation in severe RA, which occurs with several biologics, may be expected to increase lipid levels; this not only occurs in HDL-cholesterol, but also other lipid moieties, including total and LDL-cholesterol and, perhaps, triglyceride levels. This concept is consistent with emerging findings for anti-TNF treatments and IL-6 receptor inhibition in RA. Equally, some DMARDs have similar effects on lipids, albeit less marked. In any case, it is clear that potent dampening of inflammation, however achieved, broadly reduces CVD risk in RA. Therefore, changes in lipid profiles, particularly increases in cholesterol and triglycerides that occur with treatments for severe inflammation, may not represent increased cardiovascular risk as in the usual understanding of lipid-level elevations in individuals without significant inflammation. Rather, such changes in lipid levels, in part or largely, may represent a predictable response to attenuation of inflammation. Finally, in clinical practice, the current advice on the use of lipid profiles in any patient with RA is (1) to measure both total cholesterol and HDL-cholesterol and to use the total cholesterol:HDL-cholesterol ratio in conjunction with other established risk factors for the calculation of absolute CVD risk, and (2) to treat accordingly when the absolute CVD risk is high. Editorial assistance with the manuscript was provided by Sarah Longnus, PhD, Phocus Services GmbH, Basel, Switzerland. Funding for editorial assistance by Phocus Services GmbH was provided by F. Hoffmann-La Roche Ltd. We would also like to thank Thasia Woodworth and Janet Lee for their helpful comments in the preparation of this article. All views in this article are those of the authors.
. RAPID: rheumatoid arthritis. J Fam Pract 2007;56:S1–7.
. Dyslipidemia and rheumatoid arthritis. Ann Rheum Dis 1997;56:341–2.
. Cardiovascular morbidity and mortality in women diagnosed with rheumatoid arthritis. Circulation 2003;107:1303–7.
. High incidence of cardiovascular events in a rheumatoid arthritis cohort not explained by traditional cardiac risk factors. Arthritis Rheum 2001;44:2737–45.
. Inflammation: a pivotal link between autoimmune diseases and atherosclerosis. Autoimmun Rev 2006;5:331–7.
. Vascular comorbidity in rheumatoid arthritis: potential mechanisms and solutions. Curr Opin Rheumatol 2005;17:286–92.
. Explaining how “high-grade” systemic inflammation accelerates vascular risk in rheumatoid arthritis. Circulation 2003;108:2957–63.
. Atlas of Heart Disease and Stroke. WHO 2004 (cited 26 February 2008); Available from: URL: http://www.who.int/cardiovascular_diseases/en/cvd_atlas_03_risk_factors.pdf/.
. Long-term interleukin-6 levels and subsequent risk of coronary heart disease: two new prospective studies and a systematic review. PLoS Med 2008;5:e78.
. Cardiology Patient Page. C-reactive protein: a simple test to help predict risk of heart attack and stroke. Circulation 2003;108:e81–5.
. Lipoprotein(a) levels and risk of future coronary heart disease: large-scale prospective data. Arch Intern Med 2008;168:598–608.
. C-reactive protein and cardiovascular disease: weighing the evidence. Curr Atheroscler Rep 2006;8:421–8.
. A prospective study of cholesterol, apolipoproteins, and the risk of myocardial infarction. N Engl J Med 1991;325:373–81.
. Lipid profiles in untreated patients with rheumatoid arthritis. J Rheumatol 1999;26:1701–4.
. Lp(a) lipoprotein and lipids in patients with rheumatoid arthritis: serum levels and relationship to inflammation. Rheumatol Int 2005;25:241–5.
. Dyslipoproteinaemia in patients with active, chronic polyarthritis. A study on serum lipoproteins and triglyceride clearance (intravenous fat tolerance test). Atherosclerosis 1977;28:41–52.
. Effects of tumor necrosis factor blockade on cardiovascular risk factors in psoriatic arthritis: a double-blind, placebo-controlled study. Arthritis Rheum 2007;56:831–9.
. Cardiovascular risk parameters in men with ankylosing spondylitis in comparison with non-inflammatory control subjects: relevance of systemic inflammation. Clin Sci (Lond) 2005;109:171–6.
. Lipids and inflammation: serial measurements of the lipid profile of blood donors who later developed rheumatoid arthritis. Ann Rheum Dis 2007;66:184–8.
. Dyslipidemia in the critically ill. Crit Care Clin 2006;22:151–9, viii.
. Serum lipids and disease severity in children with severe meningococcal sepsis. Crit Care Med 2005;33:1610–15.
. Changes in serum lipids and lipoproteins in cancer patients during chemotherapy. Cancer Chemother Pharmacol 1992;30:412–16.
. Postsurgical reduction of serum lipoproteins: interleukin-6 and the acute-phase response. J Lab Clin Med 1998;131:103–8.
. Lipoprotein(a) and lipids in relation to inflammation in rheumatoid arthritis. Clin Rheumatol 2000;19:324–5.
. Effects of antirheumatic therapy on serum lipid levels in patients with rheumatoid arthritis: a prospective study. Am J Med 2002;113:188–93.
. Infliximab but not methotrexate induces extra-high levels of VLDL-triglyceride in patients with rheumatoid arthritis. J Rheumatol 2007;34:1997–2004.
. Effects of infection and inflammation on lipid and lipoprotein metabolism: mechanisms and consequences to the host. J Lipid Res 2004;45:1169–96.
. Apolipoproteins A-I and B and cholesterol in synovial fluid of patients with rheumatoid arthritis. Metabolism 1993;42:803–6.
. Receptor-independent catabolism of low density lipoprotein. Involvement of the reticuloendothelial system. J Biol Chem 1982;257:307–10.
. Macropinocytosis is the endocytic pathway that mediates macrophage foam cell formation with native low density lipoprotein. J Biol Chem 2005;280:2352–60.
. Effects of repeated infliximab therapy on serum lipid profile in patients with refractory rheumatoid arthritis. Clin Chim Acta 2006;365:143–8.
. Modulation of lipoprotein plasma concentrations during long-term anti-TNF therapy in patients with active rheumatoid arthritis. Ann Rheum Dis 2007;66:1503–7.
. Impact of TNF inhibition on insulin resistance and lipids levels in patients with rheumatoid arthritis. Clin Rheumatol 2007;26:1495–8.
. Short term effects of infliximab on the lipid profile in patients with rheumatoid arthritis. J Rheumatol 2005;32:252–5.
. Changes in lipid profile during infliximab and corticosteroid treatment in rheumatoid arthritis. Ann Rheum Dis 2007;66:958–61.
. Intravenous anti TNF-alpha antibody therapy leads to elevated triglyceride and reduced HDL-cholesterol levels in patients with rheumatoid and psoriatic arthritis. Wien Klin Wochenschr 2002;114:1004–7.
. Effects of infliximab treatment on lipoprotein profile in patients with rheumatoid arthritis and ankylosing spondylitis. J Rheumatol 2006;33:921–3.
. Effects of anti-TNF-alpha treatment on lipid profile in patients with active rheumatoid arthritis. Ann N Y Acad Sci 2006;1069:414–19.
. Conversion towards an atherogenic lipid profile in rheumatoid arthritis patients during long-term infliximab therapy. Scand J Rheumatol 2006;35:107–11.
. Modest but sustained increase of serum high density lipoprotein cholesterol levels in patients with inflammatory arthritides treated with infliximab. J Rheumatol 2006;33:2440–6.
. Induction of hyperadiponectinemia following long-term treatment of patients with rheumatoid arthritis with infliximab (IFX), an anti-TNF-alpha antibody. Endocr J 2008;55:213–16.
. Increased disease activity is associated with a deteriorated lipid profile in patients with ankylosing spondylitis. Ann Rheum Dis 2006;65:1473–7.
. Anti-tumour necrosis factor agents and lipid profile: a class effect? Ann Rheum Dis 2008;67:895–6.
. Treatment of rheumatoid arthritis with humanized anti-interleukin-6 receptor antibody: a multicenter, double-blind, placebo-controlled trial. Arthritis Rheum 2004;50:1761–9.
. Study of Active Controlled Monotherapy Used for Rheumatoid Arthritis, an IL-6 inhibitor (SAMURAI): evidence of clinical and radiographic benefit from an X-ray reader-blinded randomized controlled trial of tocilizumab. Ann Rheum Dis 2007;66:1162–7.
. IL-6 receptor inhibition with tocilizumab improves treatment outcomes in patients with rheumatoid arthritis refractory to anti-TNF biologics: results from a 24-week multicentre randomised placebo controlled trial. Ann Rheum Dis 2008;67:1516–23.
. Cardiovascular disease in patients with rheumatoid arthritis: results from the QUEST-RA study. Arthritis Res Ther 2008;10:R30.
. Trial of Atorvastatin in Rheumatoid Arthritis (TARA): double-blind, randomised placebo-controlled trial. Lancet 2004;363:2015–21.
. Apolipoprotein A-I inhibits the production of interleukin-1beta and tumor necrosis factor-alpha by blocking contact-mediated activation of monocytes by T lymphocytes. Blood 2001;97:2381–9.
. Effects of anti-tumor necrosis factor therapy on lipid profile in patients with rheumatoid arthritis. Joint Bone Spine 2008;75:22–4. Competing interests: EC has provided consultancy through advisory boards and speakers bureaus for MSD, Pfizer, GSK, Abbott, Schering Plough, Wyeth, Merrimack Pharmaceutical, Chelsea Therapeutics, UCB Celltech, F. Hoffmann-La Roche, Pierre Fabre Medicament, Allergan and Jazz Pharmaceuticals. NS has received fees for lectures and consulting from F. Hoffmann-La Roche and Abbott, as well as from many companies marketing lipid-lowering therapies, both statins and non-statin agents.